It was time to retire my Palm PDA, but replacing it was something of a challenge since no one really makes PDAs anymore that aren’t part of a smartphone. I’m still happy with my Virgin Mobile service, and you can’t beat the price, so I didn’t really want to upgrade to a new phone. The best compromise I could find was, believe it or not, an MP3 player. 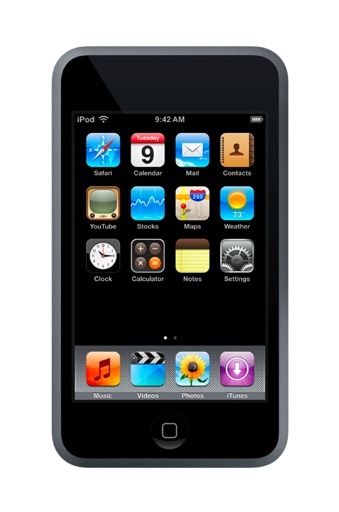 But Apple’s iPod series is really more than just an MP3 player, and the iPod Touch is really more than just an iPod. It’s been called an iPhone without the phone, which is true, but what it is really is simply astonishing. I have a lot of gadgets, but this is the first time I can honestly say that I was astonished by a piece of technology. I ran the battery dead playing with it the first time, with my mouth literally agape. I could not believe that I was listening to my music while surfing the web on a device that is not much bigger or bulkier than a credit card. I won’t continue singing its praises here — there are plenty of Apple fanboys on the internet to do that for me — but I will mention a few warts that I’ve noticed. First, and foremost, I am not at all pleased that Apple chose to charge its Touch customers for the firmware upgrade to version 3.0. Especially since the upgrade has been available for months — why aren’t these products sold with the latest firmware? iPhone users get the upgrade for free, but iPod Touch users have to pay? That is a poor business decision, in my opinion. Second, for all of the accolades that Apple receives for their unique and functional user interfaces, I have to say that the iTunes desktop interface is not terribly user-friendly. It was not immediately apparent to me, the first time I ran it, how I am supposed to manage my music and video library on my PC — it is also a bit annoying that I can’t remove songs and videos directly from the iPod Touch. Third, the notes app that comes with the iPod Touch is lackluster at best. I would purchase an app with more functionality, but then it won’t automatically sync with my desktop. This probably isn’t an annoyance for those who bought the Touch primarily as an entertainment device, but for those who are trying to replace a PDA, having a functional notes app that performs easy and reliable backups is essential. Lastly, for some inadequately explored reason, Apple saw fit to remove one piece of valuable functionality that all previous iPod devices had: you can’t use the iPod Touch as a simple USB drive! If you are willing to install some third-party apps, you can do it, but why should the user have to bother with that? I view that as a serious misstep on Apple’s part. Of course, the iPod Touch (as well as the iPhone) are all about “apps” — Apple makes it very easy to spend your money in their App Store. But they make it equally easy to find the free apps too. As I collect apps that I find useful, I will continue to update this post with links to them here. An ebook reader that is surprisingly well designed for a free app. Transfering ebooks from my PC proved to be more cumbersome that it probably should be, but once they are on the device, the reading experience is very good and intuitive. This is a pretty cool game — it’s exactly what it sounds like, a physics-based game of tossing a ball of paper into a trash can. More challenging than it sounds. It would take a lot of practice to get really good at it. The free version is definitely worth downloading. A fascinating and highly addictive logic puzzle. Can’t decide where to eat? Let this app take the guesswork out of it, and add a little fun. Shake your device, and see suggestions appear slot-machine style. If you are a Facebook user, this app is indispensable. It makes navigating the site much easier and more efficient, with the added benefit of no advertising! You can see the interface in your web browser here. You might also be interested in the “lite” version of the Facebook interface. Get your local weather fast and even view realtime video forecasts. You will not find a better RSS reader that is free. If you have a Home Theater PC and are running Boxee, you might find this app useful. It is especially handy if you are entering text into Boxee (such as search terms) because Boxee’s virtual keyboard leaves a lot to be desired (as do most). great info. Tweeted about it. I’ll bookmark this post too later.